I wanted to share an old SOF article written by a friend named David Scott-Donelan. He has been very generous with his time answering many questions I had during my research on Rhodesia and their Bush War, a War against Communism. He is a remarkable man who at the seventh decade of his life is still going strong teaching combat tracking to LE/Military Units around the world. His knowledge is invaluable and his book is an excellent primer to get out there and practice the craft. The article below is an interesting piece of history that is forgotten by most history books, even on Rhodesia. Rhodesia was hardly a nurturing environment for an experimental military unit. Most soldiers were concerned with simple survival, particularly in the earlier days of the country’s no-holds-barred bush war against communist guerrillas. In those times, the government’s troop strength was low and resources to patrol a 1,000-mile border and 150,000 square miles of hinterland were severely limited. But history demonstrates some of the toughest life forms spring from harsh environments. In Rhodesia, when you talked tough, you talked about the Army’s Tracker Combat Unit. From TCU’s small nucleus of original members came an impressive roster of military leaders including Andre Rabie and Allan Franklin, founding members of another innovative and deadly organization, the Selous Scouts. Other original TCU members included Brian Robinson, who later commanded Rhodesia’s Tracking School and Special Air Services at the height of battlefield commitment of that unit. TCU plankowner Joe Conway was decorated for tackling four terrorists while armed only with a bayonet. And ‘T.C.” Woods survived an underwater battle with a crocodile, even after the man-eater chewed off one of his balls. The original members of the Tracker Combat Unit were veterans and genuine hard-cases. They had to be. TCU soldiers also had to be innovative. They formed their unit out of not much more than a concept and an urgent necessity. Short on resources but long on initiative, the Rhodesians “waged a campaign of extreme professional competence that will deserve a place in the world’s Staff College courses for many years to come,” according to John Keegan’s World Armies. Rhodesia’s problem was engaging hostile guerrillas in a large area with limited manpower. And as important a part of military field operations as it is, patrolling was often an ineffective means of contacting the enemy in the vast bush of southern Africa. Without luck Or adequate military intelligence there was generally no contact, particularly if the insurgents had the assistance of the local population. Fighting terrorists —when they could be forced to fight — was easy. Finding them is another story and the genesis of the TCU. In 1965, foreseeing the fundamental problem of covering large areas with limited troops in heat that often exceeded 110 degrees, the Rhodesian Army adopted a solution suggested by ex-game ranger turned ecologist, Allen Savory. They began experimenting with trained tracking teams which could react to any incident or reported presence of terrorist groups. That may seem simple enough. American Indians have tracked human and animal quarry for centuries and the British used Iban trackers in the Malayan Campaign. But the Rhodesians developed the basic fieldcraft into a tactical science that later accounted for the deaths of many terrorists who mistakenly thought there was no danger in leaving a track of communist-supplied boots across the African veldt. Savory’s concept took native tracking and turned it into a military discipline. He argued that a soldier already skilled in patrols, ambushes and tactical maneuvering could better almost anyone in the man tracking game once trained in the necessary techniques. From Rhodesia’s SAS he selected eight men which he felt had demonstrated special potential to form a test group. Savory put them through a Spartan, rigorous training program in the Sabie Valley adjacent to the Mozambique border. Eight weeks in the field, two weeks back in town and another eight weeks back in the bush was just enough to bring his men to what he felt was the required standard. It was just in time. The insurgency situation projected by Rhodesian military commanders soon became a reality. In 1966 the war began with the infiltration of a combined Rhodesian and South African terrorist gang into the Wankie National Park in the northwestern corner of the country. The Rhodesian Army made initial mistakes in reacting to the threat but field soldiers quickly learned some vital lessons. Government troops took several casualties but all 40 terrorists were killed or captured. The need to track and locate similar guerrilla bands became obvious. Military authorities approved the TCU as a permanent unit. Savory began looking outside the Army to avoid the charge that his priority tended to strip units of their best men. Since he’d served several years in Rhodesia’s Game Department, he already knew the type of man he wanted. Over the next few months he contacted former colleagues and his fledgling unit began to take shape. He selected 12 bush veterans who were excellent marksmen and trained soldiers. TCU was officially born. The early lessons learned by the pioneer SAS trackers were strictly applied to the vast font of bush knowledge most men brought into TCU and a rigorous training schedule was designed to teach tactical application. They began their training by tracking in pairs; one tracking the other over increasing distances. Bushcraft and survival skills were perfected and much time was spent on jungle ranges to improve reflexes and instinctive shooting. Great care was taken to practice silent movement. All communications were by hand signals. Silent dog whistles were also employed. When blown in a certain way they produced a sound similar to that of a local beetle, recognizable to a trained ear but meaningless to the uninitiated. Once individual tracking was learned, the trainees were introduced to team tracking. This involved a four-man team: a controller, a primary tracker and two flank trackers. The team was deployed on the spoor in a V-formation with the two guard trackers placed slightly forward and to each flank to protect the main man whose concentration would be locked onto following the spoor. The controller was placed in the rear of the team to coordinate and control tactical movement. Team members were trained in all four positions and periodically rotated to prevent fatigue. Some of the most effective training was accomplished when one team would lay a spoor of a fairly long distance and then prepare an ambush for the tracking team. They would ambush their pursuers with slingshots. This method enabled trackers to spot likely ambush sites and also helped develop a good eye for the selection and concealment of ambush positions. A painful welt from a slingshot missile was the motivation to avoid carelessness. Longer and longer reaches were worked by TCU teams until they could hold on a spoor for several days with comparative ease. After a training segment which taught them how to cover their own track and avoid detection, the trainees were ready for the final tactical exercise: a competition between three four-man teams. Wearing only shirts, shorts, boots and hats each team member was given rations consisting of four tea bags and a four-ounce packet of shelled rice. They were assigned a series of map coordinates to follow over a seven-day period. The exercise was planned so that routes would cross and the objective was for each team to track and hunt down the other two groups. The rules were simple. If a team caught another team, they were allowed to confiscate anything from their prisoners. It was not unusual to see naked trackers slinking through the bush in pursuit of their confiscated uniforms. In the final phase of training, live ammunition was used to accustom trackers to the realities of combat. Once training was completed, the TCU members returned to their homes or other duties until there was a need for their specialized services. Generally, it was not a long wait. 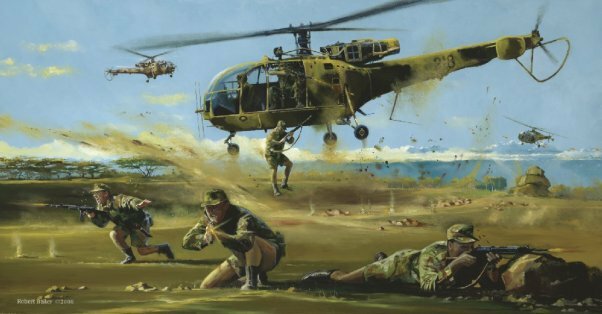 The first real operation for Rhodesia’s TCU was in 1967. Zambian-based terrorists made a significant incursion into northern Mashonaland. Several guerrilla base camps across the Zambezi Valley floor were set up by 110 terrorists who had infiltrated Rhodesia undetected. A game ranger —David Scammel who later became a tracker team member — found their spoor wruie checking disturbed wildlife patterns. The newly-formed and trained TCU was mustered and given the task of locating the guerrillas. After some significant reconnaissance, an attack was mounted on the primary terrorist base camp and many of the gang were killed in the ensuing action. Some managed to escape the Army’s attack, but they were not home free. A second phase of the assault was opened including a series of pursuits by trackers. In this operation, TCU member Joe Conway tracked four guerrillas 60 miles over three days across broken terrain. The chase ended when the thoroughly demoralized terrorists raised their hands and surrendered. The captured commies complained profusely at their Rhodesian government trial about having been tracked down like wild animals. Conway and the other TCU trackers just beamed at that. In December 1969, the terrorists struck again in attacks on Victoria Falls Airport and a police base while using explosives to cut the Rhodesian/Zambian rail line. Within eight hours, two TCU teams were on the trail and they discovered that 22 guerrillas had been involved in the three-pronged strike. Before they could run the terrs to ground, a heavy thunderstorm washed away the spoor. Several days later, after police found suspicious tracks, a second TCU team was choppered in to investigate. They followed the trail for several miles to a place where a deliberate effort had been made to obliterate the tracks. The spoor seemed to be the same one that had been washed out earlier and indications were that the terrorists had moved into a heavily wooded ravine. The TCU members skirmished forward. Not 30 yards into the bush, one tracker found a Russian-made pack hastily concealed in a hole. A thorough search of the area revealed 22 sleeping spaces and 20 more packs containing ammunition, grenades, food and clothing. The signs clearly indicated the terrorists had fled when they discovered skilled trackers were on their trail. Despite the lack of contact, the TCU had managed a victory. The guerrillas lost their base camp and were forced to split into smaller groups which made them vulnerable to Rhodesian patrols. More heavy rains prevented the TCU from staying on the track but at first light the next morning an Army patrol discovered fresh spoor and called the unit into action. The trail appeared to be leading to an abandoned stone quarry several miles away which was a likely location of a terrorist rendezvous. A TCU team was inserted along the anticipated route and they quickly spotted three terrorists squatting under a tree to escape the rain. Using their bush skills, the TCU members crept to within 20 yards, and counted coup: three shots, three confirmed terr KIAs. The entire guerrilla unit was ultimately located and liquidated. The TCU was involved in virtually every incident of insurgent infiltration over the next few years. Hundreds of successful pursuits were launched based on TCU information and intelligence. Large numbers of terrorists were killed with only one TCU combat death. In one of the world’s classic military ironies, the TCU’s success ultimately led to the unit’s demise. The tactics and techniques which the Tracker Combat Unit pioneered and proved led the Rhodesian government to decide that similar training should be mandated throughout the Army. As a first step, the TCU was ordered into the ranks of the Selous Scouts while some veterans were seconded off to form Rhodesia’s widely-acclaimed Tracking and Bushcraft School on the shores of Lake Kariba (the famed Wafa Wafa). Hundreds of soldiers, both black and white, were trained there, including several from friendly Western countries. Much of the Rhodesian Army’s success against insurgents from the Zimbabwe African National Union (ZANU) and the Zimbabwe People’s Revolutionary Army (ZIPRA) can be directly attributed to the school and Allen Savory’s foresight and wisdom. This was Capt. David Scott-Donelan first appearance in SOF magazine. Scott currently owns and runs the Tactical Tracking Operations School (TTOS) in United States. His military service spans two-and-a-half decades and several countries. From 1961 until 1980. when the government was turned over to Marxist insurgents, he served in Rhodesia’s most outstanding military units, including the Special Air Service, the Rhodesian Light Infantry, the Selous Scouts and the Tracker Combat Unit. Among other duties, the British citizen has served as an SAS troop commander, intelligence advisor, manager of counter-insurgency operations, commandant of the Rhodesian Army Bushcraft and Tracking School. and as a training officer and group commander for the Selous Scouts.